The majority of BioQUEST faculty workshops are off-campus, such as the BioEd Workshop held at the University of Western Cape in Cape Town, ZA shown above. 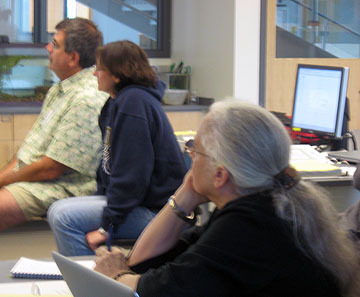 However, BioQUEST has held a curriculum development workshop for faculty participants at Beloit College every summer since 1992. We consider this intense summer experience an unique opportunity for you to explore contemporary problems in biology that you can introduce into your own classroom, laboratory, field or computational experiences. You will have an extended opportunity to collaborate with undergraduate science educators and researchers. Several projects started at a BQ summer workshops are ongoing years later. The 2010 summer workshop explores global health issues with an emphasis on cyberlearning resources. During this two day phase, we will collaboratively explore data, tools, and resources focused on global health curricula. Based on these experiences, groups of participants will share their extended work from one or more sessions on Tuesday after dinner. During the second phase of the workshop, participants take on the role of adopters, adapters and reviewers to consider implementing investigative global health approaches in their own courses. Small groups will share their curricular modules on Friday.